Naka G: My favorite album in the whole world is 6th Otakebi Album. Yoshida: Your favorite in the whole world?! Minewaki: Those are good. Which do you like better? Naka G: “Ground Demo Rouka Demo Medatsu Kimi.” It’s Kumai-chan and Sudo singing by the two of them. Naka G: Even the intro is amazing. 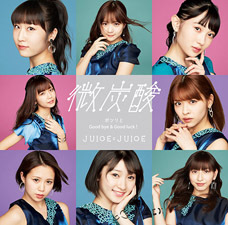 I loved “Omoitattara Kichi desse!” (sung by Tokunaga Chinami, Sudo Maasa and Kumai Yurina) that was on the fourth album, 4th Ai no Nanchara Shisuu, and I love “Ground Demo Rouka Demo Medatsu Kimi” equally as much. Yoshida (while looking at the CD jacket): She wasn’t yet doing the Momochi Musubi in 2010. Minewaki: Yeah. Quite surprisingly, she didn’t actually have them in most of their CD jackets. 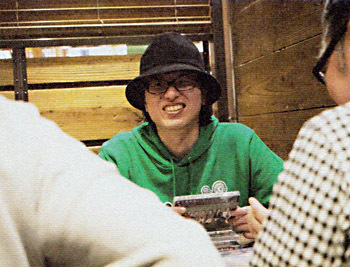 (looking at the CD jacket) Ah, Maasa sure is cute here. Naka G: You got to attend their event at Yomiuri Land with the purchase of 6th Otakebi Album. Minewaki: I didn’t go to that one. Did you? Yoshida: Even though it’s your “favorite album in the whole world“? Naka G: I know, right? Why did I not go? I wonder if I actually had some proper reason for not going…? Yoshida: I wouldn’t know. (laughs) I mean, did you forget about it or something? Naka G: Yeah. 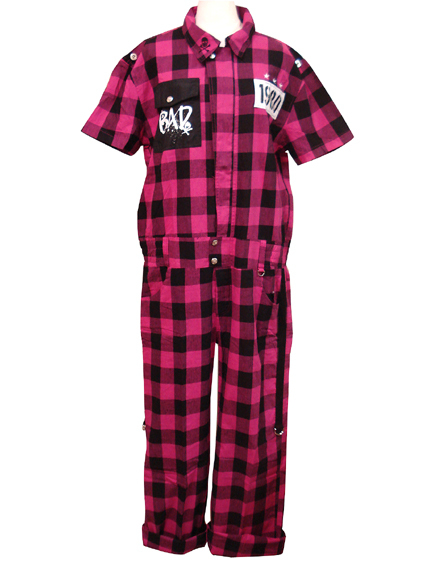 So then they released a DVD of the event and everyone was wearing those pink, SUPER LOVERS overalls. It was great. Naka G: Exactly. I’m still so bummed out about it. Yoshida: I get that. It’s those kinds of life experiences that end up turning one into a person who starts going to all of the events so they don’t miss anything ever again. Minewaki: The following month, Risako was talking in Top Yell magazine about how the song had been requested by me, and so she had been thinking about me while singing it. — While we’re at it, why don’t you discuss the appeal of Berryz Koubou in general. Naka G: I love all the songs Tsunku♂ writes for children. Yoshida: He’s definitely freer in writing those songs as he is when writing for adults. Naka G: Exactly. Early °C-ute and Berryz Koubou’s 1st Chou Berryz — they were all elementary schooler songs, right? Yoshida: The first album is amazing! Minewaki: Indeed. But is it just me or were there no other groups featuring kids that small around back then? When the Hello! Project Kids debuted, their average age was probably around 10 years old. Thinking back on it now, they were much too young. Yoshida: There are more child idols now. They’re all so young today. Naka G: What are your favorites from the first album? Naka G: “Anshinkan!” Yeah, that’s a must if you’re a Kuma wota. Minewaki: Right — I’m saying that especially as a Kuma wota. 2006’s Nyoki Nyoki Champion! was the first tour Kumai-chan did after graduating from elementary school, and she sang “Anshinkan” solo while wearing that idol dress. She then came out carrying a randoseru and left it on the stage, symbolizing her own graduation. Naka G: And what’s more is that that was in fact Kumai-chan’s actual randoseru. Yoshida: Right. Not just a prop. Naka G: What song did you end up choosing? Yoshida: That’s the single worst possible answer! — Go, what’s your favorite Berryz Koubou album? Yoshida: I like all the early albums, but I don’t have a strong emotional attachment to them unlike these two. I kinda feel guilty for even being here! Naka G: You do see glimpses of some of those early days. Like they’ve inherited parts of it. Yoshida: Hey, you said it, not us! No, but really: I’m quite aware that I, too, am a lolicon when it comes to the subject of music. That is to say, of course songs that are about projecting childhood are best sung by children. Their ineptitude is what makes those songs work. I feel like that’s partly the reason arrangers like Konishi Takao decide to use children’s chorus vocals in their songs. Minewaki: And it’s just fun to listen to. That’s why I’m looking forward to the new Kenshuusei unit so much. Just what kind of a worldview will their songs have?! Yoshida: Seeing the footage of Hama-chan being chosen for the group made me cry — and I say that as someone who doesn’t even have a particularly strong attachment to Hama-chan or anything. I cried regardless! Minewaki: Oh, yeah, I just completely lost it when they announced it. My only gripe is, the camerawork during that announcement was just atrocious. You could hear Hama-chan wailing but they didn’t show her! I was busy staring at her reflection in the window behind Maimi who was making the announcement. — Let’s get back on topic. How about your favorites aside from Berryz Koubou? Naka G: Hey, I still want to name another song from them! Yoshida: Let me guess: you want to promote something from Dai ② Seichouki, don’t you? Minewaki: “Sabori” is a good one. Naka G (facing the tape recorder): If you buy this album, don’t you dare skip this song! Yoshida: I bet if it was Naka G making his own Hello! Project compilation album, he’d be putting this song on there. Minewaki: These are the kinds of songs they’ll only do at fan club-only tours and whatnot. I wish they’d perform them during regular concert tours, too. Ah! “Ohiru no Kyuukei Jikan” with its opening spoken lines is another great example. Yoshida: Honestly, when you look at the setlists they do at fan club-only events, that’s what makes you actually want to join the fan club. Yoshida: Hahaha. You sure love your randoseru. — So far, we’ve barely talked about anything aside from Berryz Koubou. (laughs) Shall we move on to the albums of °C-ute? 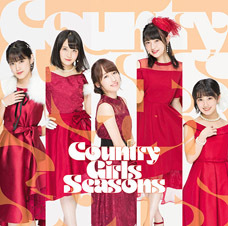 Naka G: I like early °C-ute. Every song on their first album, Cutie Queen VOL.1, is great. I like how “Time Capsule” and “EVERYDAY YEAH! Kataomoi” are are paired up on the album. The lyrics of “EVERYDAY YEAH! 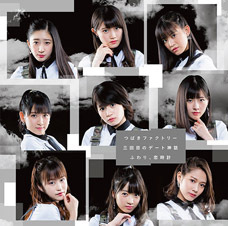 Kataomoi” — a song about a girl’s unrequited love — are really cute. It has to be one the greatest Tsunku♂ loli songs. That’s how much I love it. Yoshida: Yep. But isn’t it sad how, the older they get, the less they perform those early songs live? Minewaki: It is. They hardly do any of the album songs now. “Massara Blue Jeans,” sure, but “Time Capsule“… not so much. Minewaki: Ah, Suzuki Airi’s solo song. It’s great. As is Nakajima Saki and Hagiwara Mai’s “Disco Queen.” I want to see Yajima Maimi’s “Natsu DOKI Lipstick” performed live again. Naka G: The one where Maimi dances like crazy. Minewaki: Of these songs, they still perform “That’s the POWER,” but not “Tsuugaku Vector☂” or any of the other solo songs. I wish we got to hear them live again. All the songs on the second album are great. Naka G: Exactly! This album is fantastic! — What would you name as your favorite album, Company President Minewaki? Minewaki: I’m going to say Matsuura Aya’s First KISS. Minewaki: When I heard it was going to be an album book this time and I got to thinking about it, I came to believe that it might just be the single greatest masterpiece in the history of Hello! Project. Yoshida: She didn’t sound too childlike, and it had the necessary quality to appeal even to non-idol fans. Minewaki: I get so moved listening to “Sou Ieba.” If I was told to pick one favorite Matsuura Aya song, it might just be this song. That’s how much I love it. Naka G: “Oshare!” is great, too. Minewaki: It’s amazing. That tune reminds me of aiko. Naka G: But the album ends on a lonely note, doesn’t it? Minewaki: Would you have preferred a more energetic ending? Minewaki: In any case, Ayaya’s first album is… I’m not sure if this is the right way to put it, but it’s quite rare for an idol to ever come out with an album that’s this accomplished. Yoshida: The album tracks are all such high quality, it’s no wonder the album has seen another wave of appreciation in recent times. — What are some of your other favorites besides Matsuura? Minewaki: I also like Tanpopo’s first, TANPOPO 1. Yoshida: All of Tanpopo is amazing, too. Minewaki: Uh-huh. Man, I sure did listen to my fair share of Tanpopo. The sad thing is, TANPOPO 1 is no longer being pressed. We don’t even sell it at Tower Records these days. Yoshida: They should re-release it with all the coupling songs as bonus tracks. Which songs of theirs do you like? Let me guess: Yaguchi’s “Sentimental Minamimuki“? Yoshida: Yaguchi is a very talented vocalist, isn’t she? But even so: Tanpopo really was special. The 1st and 2nd generations were completely different and yet equally great. Minewaki: He meant to describe how funky their music sounded to him. — How about Morning Musume? Minewaki: I’m aware that everyone already knows it’s a masterpiece, but even so: Second Morning is full of great songs. Yoshida: I can’t even begin to guess how much I’ve listened to First Time and the second album during my lifetime. Yoshida: That song has a nice kayou kyoku feel to it. Naka G: “Sou da! We’re ALIVE,” too. Nacchi’s “Otoko Tomodachi” and 5th gen’s “Suki na Senpai” are good as well. Minewaki: I hope they continue singing “Suki na Senpai” in concert. “Ii Koto Aru Kinen no Shunkan” is also a good song. As are “Mr. Moonlight ~Ai no Big Band~” and “Hajimete no Rock Concert.” Yep, it’s a great album. 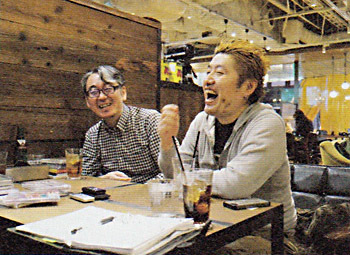 Yoshida: You really get a sense for how energized everyone was back then. Naka G: I do love that song. Minewaki: If memory serves me right, they first sung that song at Saitama Super Arena. Naka G: I remember that very well. It was during the LOVE IS ALIVE! tour. Nacchi was singing “Otoko Tomodachi” in the center with 5th gen behind her. When the song ended, Nacchi walked away and 5th gen sang “Suki na Senpai” together. That sudden change left me mesmerized. I’ll never forget it. — What about Melon Kinenbi? Yoshida: We’d been waiting forever for their first album, and that’s what they gave us… (laughs) It made it pretty obvious how little money they wanted to spend on the group. Minewaki: At the time, I read many of these articles by Okite Porsche where he was praising them, and that prompted me to start going to their shows. Thinking about the hardships of those four back then, hearing a song like “ENDLESS YOUTH” now just makes me cry. Also, at their first solo live show at Akasaka BLITZ — it was a snowy day — that was the first time ever that moshing occurred at a Hello! Project concert. — The moshing during “This is Unmei” was incredible. Yoshida: All these people who had been used to moshing at club events suddenly found their way to Melon’s shows. It makes you wonder what might’ve happened with the group had they moved more in the direction of those kinds of “mosh songs.” All of a sudden they’d found popularity in that sort of scene, but they changed styles right away. Minewaki: Right. Just looking at their singles, “This is Unmei,” “Saa! Koibito ni Narou,” “Natsu no Yoru wa Danger!,” “Kousui,” “Akai Freesia“… their genre was constantly changing. Still: I was buying all their merchandise at the time. Yoshida: Although you don’t even have that much of an emotional attachment to Melon? — Could you tell us about some of your favorites, Yoshida? Yoshida: Whenever they released those cover albums, like THE GARAGE’s Garage Opening Song Shuu or FOLK SONGS or the like, the fans’ reactions were never very excited. But you’d always have a couple of people like me who would be ecstatic about them. “Huh?! “Tunnel Tengoku”?! They’re covering The Dynamites? !” “”Salvia no Hana”?! They now have a direct link to Hayakawa Yoshio!” That kind of thing. (laughs) Though, to be honest, the covers themselves weren’t all that impressive… But starting from around FOLK SONGS 3, Yano Hiroyasu started doing arrangements for Hello! Project. That was interesting. Minewaki: They did a concert for FOLK SONGS 3, too. It featured members like Nakazawa Yuko, Mikitty and Gocchan. Yoshida: If I was to name an album… Kopinks! Melodies ~star chart~ was one of the most accomplished albums I’ve heard in recent years. Minewaki: Miyamoto Karin-chan! That’s such a good album. You said you attended the event for it in Shizuoka, right? It’s quite rare for you to attend events, no? Yoshida: That might’ve actually been my first one. I’ve been to Shizuoka twice just to see Kopink. Minewaki: The material on this album was originally supposed to only be released online, wasn’t it? — Now that you’ve brought up the Eggs… What do you think about S/mileage’s albums? Yoshida: Their debut, Warugaki ①, is a good one. No doubt about it: by far my favorite group from that period of time was S/mileage. Minewaki: The second album, ② Smile Sensation, is good as well. Naka G: It is. I like that one, too. 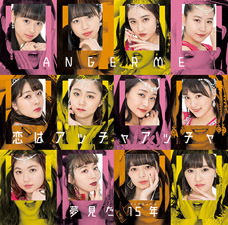 — Their more recent songs — after the name change to ANGERME — have been well-received as well. Minewaki: Sorry to go off-topic, but the Pucchi Best albums will be included in this book, right? Every now and then they’ll release a good Pucchi Best album, too. Minewaki: Like, with really good song selections. Pucchi Best 10 was the one with the new Pucchimoni and stuff. I remember listening to that one quite a lot. Yoshida: Hey, we haven’t talked about Mano Erina yet! Her debut, FRIENDS, is a great album. I like the second one, MORE FRIENDS, too… but FRIENDS is just perfection. Like, how often do you get idol albums of that quality? For me, quality-wise, it’s like the second best album ever — right after Matsuura’s debut. 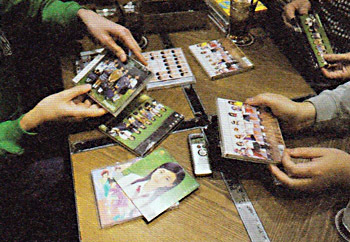 Minewaki: The first one had quite a lot of KAN songs. Yoshida: Right. That unsteadiness is what made the original “Manopiano” so great. (laughs) But re-recording it had the positive effect of highlighting the importance of singles. Minewaki & Naka G: Ahh. Yoshida: It’s beautiful. It’s not often that they’re able to convey their gratitude to the fans at their graduation concert to that extent. Minewaki: It’s isn’t, no. It made me envious of all the Mano Friends — she conveyed her gratitude to them simply through a song. Her graduation concert was great. She’s done some live shows after that, too, though. Yoshida: I guess the intended meaning was that she’s no longer an idol, even if she does sing. Minewaki: KAN only did one more song for her on MORE FRIENDS — that bossa nova-influenced track. Yoshida: “Dare ni mo Iwanaide.” Great song. Minewaki: It made me think once more about how great KAN is. — Any other favorite albums? Naka G: Of the Kirarin☆Revolution anime, I like the Kirarin☆Revolution Song Selection series and Tsukishima Kirari’s Best☆Kirari. Yoshida: Those are fantastic. I love them. Yoshida: I adore that song so much I could die! Minewaki: Kusumi Koharu, Kitahara Sayaka, Kikkawa Yuu — MilkyWay. Naka G: I love Saaya’s voice so much, sometimes just hearing it is enough to make me tear up. Yoshida: You’re too easily moved! Naka G: It’s that “fleetingness” of her voice… there’s just something indescribable about it. I really loved the way her voice sounded in MilkyWay. Yoshida: They have an album song by Maeyama Kenichi (Hanasaki Kobeni starring Kikkawa Yuu – “Hana Hatena“). That’s a good one. Naka G: They each have their solo songs. Saaya’s song (Yukino Noeru starring Kitahara Sayaka – “Makenki! Tsuyoki! Genki! Maemuki!“) was really good, too. 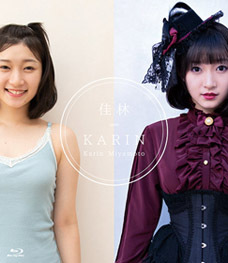 Minewaki: Let us also not forget about Kumai-chan’s unit, Guardians 4. Naka G: Guardians 4 was nice. Minewaki: It’s just that they never released an original album. Pretty much the only two collections their songs were included on were Shugo Chara! Song♪ Best and the video version, Shugo Chara! Clip♪ Best. Yoshida: Oh, and I forgot to mention Tsuji-chan’s album. — You mean her solo album? Yoshida: Yes. In collecting data for the compilation album that I selected tracks for (Hello! Project no Zenkyoku kara Atsumechaimashita! Vol. 2), I found out that Tsuji-chan’s album actually included a song that was supposed to appear on W’s third, unreleased album. Listening to it now, it does sound like an H!P song from that era. It’s really good. Minewaki: Right. We were talking about how even the wota might not know about this bit of trivia. If people knew how good this song is, they’d definitely go out and buy it. Yoshida: The album is already worth buying for that song alone. 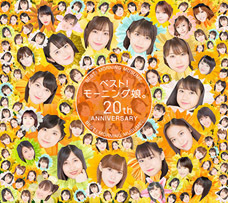 It’s a cover album called Minna Happy! Mama no Uta — other songs featured on it include “Oshiri Kajimimushi.” (laughs) But for some reason it also has this original song called “Chibi★Devwil” — this is the one that was probably originally meant for Tsuji and Kago. Keep that in mind when you listen to it and you’ll recognize that it’s really good. Minewaki & Naka G: Hmmm. — Anything else you wish to mention? Minewaki: Is Buono! going to be included in the scope of this book? I like all their albums, but if I had to pick just one, I think I like their debut, Café Buono!, the best. 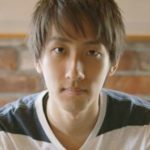 Yoshida: If they’d continued their activities full-time, I feel like they would’ve ended up receiving a lot more recognition. When Buono! appeared at Sashihara’s event (“Sashihara Rino Produce Dai Ikkai Yubi Matsuri ~Idol Rinji Sokai~” held on 2012/6/25), everyone’s opinion of Hello! Project shot way up. — Let’s try to wrap this up. In closing, please discuss what makes Hello! Project albums so interesting. Yoshida: Well, there are two types of good albums: the really accomplished, perfect albums… and the ones that aren’t quite as perfect, but that still have one or two godly songs. That’s not just a Hello! Project thing — it happens with everyone. Every group tends to have exceptionally good first albums. I think the three of us, too, mostly named early songs as our favorites. It makes me think that the energy of the first and second album, and the greatness of a group’s early activities, isn’t something that’s limited only to bands. — It’s an important factor in establishing a personality for the group. Minewaki: Albums have a tendency of just becoming single collections, but in the early era of any given group, there’s always that heightened feeling of “come on, let’s make a proper album here.” I mean, Café Buono! 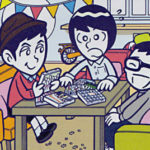 had “Hoshi no Hitsujitachi” — a song composed by Tsutsumi Kyouhei! Yoshida: That was my entire reason for buying the album. Minewaki: Hashimoto Jun writing lyrics and Tsutsumi Kyouhei composing the music — that’s the same duo who wrote the 1969 smash hit “Blue Light Yokohama.” Tsutsumi had mostly ceased working altogether around this time. Minewaki: It came completely out of the blue. The duo worked together once again on the group’s third album, We are Buono!, on the song “Koucha no Oishii Mise.” That’s no small thing. — The more you dig into the details, the more you will find ways of better enjoying these albums. Is there anything else you wish to say? Naka G: Well… In closing, could we talk a little bit more about Berryz Koubou? Naka G: Well, I just wanted to reiterate that, at the end of the day, the loli era of Berryz Koubou was my favorite. Naka G: I like their early days… but they have such a long, varied history, don’t they? I liked the Inazuma Eleven songs; the Thongchai McIntyre songs… The group may have had its ups and downs, but I do like the spot they find themselves in today. I feel glad to have watched over them all this time. — By the way: has your favorite member within the group ever changed, Naka G? Naka G: It was Momochi at first. I mean, they were still just children at the beginning so I didn’t really have a specific favorite, but I thought Momochi was funny. But at around “Koi no Jubaku,” it changed to Kumai-chan. It’s been that way ever since. Minewaki: For me, it was Shimizu Saki-chan first, then Momochi, and then Kumai-chan. Naka G: That’s quite a big change. Yoshida: So even you’ll sometimes change favorites, huh. — I feel like Shimizu’s looks have evolved quite a bit. Minewaki: Ah, you mean when she was a guest on Idol 36bou. Naka G: Yep. It really was. Yoshida: We did follow them for a long, long time. Naka G: It really does feel that way. I could see these guys getting into a fist fight over Mano Erina’s honor with the sound engineer who thought that Mano was the worst singer he had ever heard (including non-singing TV talents). I love it when people praise Berryz. They deserve it.